Depending on the variant, the Tata Tiago costs close to a lakh more than the Renault Kwid. So should the narrow premium motivate you to upgrade in advance? One model wonders – there’s no lack of them in India. The EcoSport held and continues to hold that title for Ford. Renault, too, knighted the Duster with that label, until last year when the French carmaker launched the Kwid. This hatchback in an SUV’s clothing proved to be what a lot of Indians love and while the competition included a mini-behemoth like the Maruti Suzuki Alto 800, the new k(w)id on the block managed to get the money rolling Renault’s way. Tata, on the other hand, has needed something to shake up the market for quite a while now. The Zest and Bolt entered the fray to give buyers a taste of the new Tata, but not enough people chose them off the menu. However, with the launch of the Tiago, the Indian motoring magnate has pulled a men in black, flashing the long-in-the-tooth Indica out of memory and showing us what it’s capable of when those socks are pulled. Now, if you’ve read so much as a news report on both these cars, you’ll know that they aren’t exactly bedfellows; or are they? Tata’s lust to see the Tiago succeed has given the hatchback a price so aggressive that apart from undercutting rivals like the Celerio and Grand i10, it actually overlaps with certain variants of the Kwid. Simply put, it’s time for a pocket-friendly face-off! The Kwid is the lovechild of a market liking and a quirky idea to satiate it. We’ve seen a fair share of pseudo-SUVs like the VW Cross Polo and Toyota Etios Cross, but while those cars are hatchbacks with SUV-icing, the Kwid has been designed to look like an SUV from the ground up. The little car sports beefy body panels; a tall window-line; black cladding all around; a chunky, black grille and a fairly flat bonnet. The skinny 13-inch wheels leave quite a wide gap in the wheel arches, but considering the budget-centric ethos of making this car in the first place, it’s forgivable. Meanwhile, the Tiago makes me think of three words – attention to detail. It’s one of the cleanest designs I’ve seen and makes me want to commend and criticise Tata at the same time. Tata, if you were capable of such good work, why’d you make us wait so long to see it? Be it the glossy honeycomb-mesh grille that seamlessly blends into the headlights, the subtle shoulder line that cuts through the arrow-shaped door handles, the slimming black portion of the rear bumper or the black extensions on the roof spoiler; every design element has a purpose. Sure, the Kwid has the butch factor on its side and provides the utilitarian appeal that the Tiago doesn’t. However, Tata’s little car has class. It simply looks dapper with every minute angle making an effort to blend with the other styling highlights. Even the paint quality is nice and uniform and while the Kwid’s build feels light and tinny, the Tiago feels surprisingly solid and premium. Who says low-cost has to equal a compromise on quality? It’s a question Tata seems to have asked while designing the Tiago’s cabin. You’ll find yourself needing reminders that this is, in fact, a Tata, because it’s so well put together. The interior quality seems to be from a segment above and there are no glaring rough edges. The black and grey dashboard palette is mature with understated silver and chrome bits livening things up. You even get body-coloured AC vent surrounds if you opt for the top-end ‘XZ’ variant in ‘Sunburst Orange’ or ‘Berry Red’. There’s also a decent amount of storage spots in the doors and centre console, with a generous glovebox as well. While the Kwid is a car that’s been built to a cost, the cabin is actually easy on the eyes. The dashboard has a quirky, yet pleasing layout, and Renault did well in going with a dark grey theme. The interior quality gives you nothing to write home about, but practicality isn’t an oversight. There’s a good amount of storage spaces available, including two gloveboxes (upper one is huge! ), a dashboard-integrated shelf along with more space in the door pads and ahead of the gear lever. Renault’s most affordable offering is surprisingly spacious for a car this small, thanks to the 2422mm wheelbase. That’s more than what you get with the Alto or Eon. There’s a good amount of leg and knee room and four average-sized adults can fit in, but three at the rear will be a tight squeeze. The glass area is generous and lets a lot of light in, and when combined with the accommodating headroom, you get a cabin that feels airy. Not only is the 300 litre boot space great for a car in this segment, it’s more than what you get in the Tiago (242 litres), Alto (177 litres) or even the Swift (204 litres) and Grand i10 (256 litres). The Tiago is understandably better in terms of interior space, but while you get more leg space and knee room, the head room is almost on par, even though it is 57mm taller than the Kwid. One issue that both cars share is the way the dashboards jut into the driver’s knee if you are taller than average, and it’s more noticeable in the Tata. While there isn’t much space to rest your left foot during highway trips, it is better than what the Kwid offers and you get a dead pedal, too. However, the Tiago’s floor pedals could have been spaced better and need some getting used to for those with larger feet. When it comes to comfort, the Tiago wins hands down. The seats have better cushioning, offer more support and have the better grade of upholstery fabric as well. Additionally, you get a tilt-adjustable steering wheel, height-adjustable driver’s seat and the headrests are adjustable too – all missing from the Kwid. It’s the same story with the feature list – decent in the Kwid, but simply expansive in the Tiago. Sure, unlike the Tiago, the Kwid’s top-end variant gets a 7-inch touchscreen infotainment system with navigation and for a car this cheap, the system’s touch-sensitivity is acceptable. However, there isn’t much else to talk about apart from this feature and the sound quality from the two-speaker setup is poor. The Tiago on the other hand gets the ConnectNext infotainment system by Harman that includes turn-by-turn navigation which works in conjunction with the NaviMaps Android app. The highlight, though, is the eight-speaker (including four tweeters) sound system that beats the setups seen in more expensive cars. The Tata also gets power windows on all four doors, steering-mounted audio controls, the ‘City’ and ‘Eco’ drive modes, electrically adjustable wing-mirrors and most importantly, you can have it with ABS, EBD and an airbag for the front passenger, none of which are even optional on the Kwid. Adequate – it’s a word that best describes the pedigree of the engines that power these cars. As expected, they’re tuned for fuel efficiency and with ARAI rated figures of 23.84kmpl (Tiago) and 25.17kmpl (Kwid), they deliver that in spades. 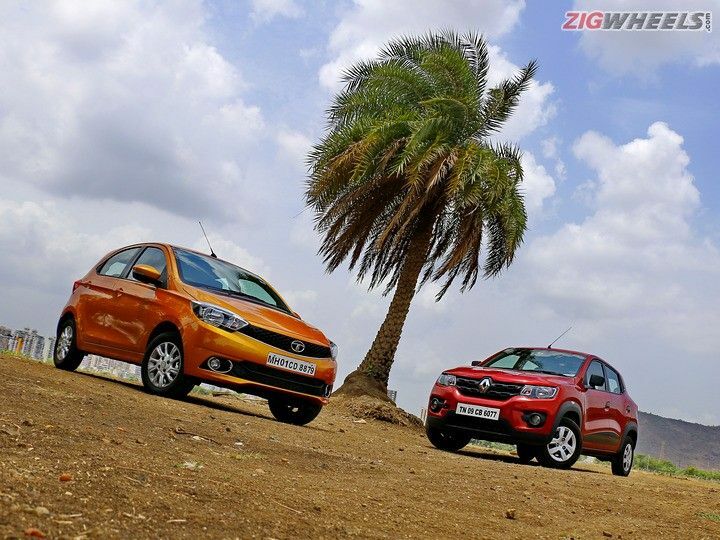 However, neither one of these engines are very refined and while the Kwid’s 0.8-litre, 3-cylinder mill (54PS/72Nm) is louder, the Tiago’s 1.2-litre, 3-pot motor (85PS/114Nm) churns up more vibrations, especially while idling. Both engines do a good job at city speeds, but aren’t great performers. Mash the throttle and the speedometers take their time to get up to 100kmph. The Kwid’s engine feels more rev happy, but even though it’s nearly 300kg lighter than the Tiago, the latter makes 31PS of power and 42Nm of torque more, which results in better, if not thrilling performance. The Tiago is also better at managing highway speeds, but overtakes will take some planning. Both cars have easy to use gear levers, though the Kwid’s feels a bit notchy, and while their clutches are light enough for convenient city usage, the Kwid’s pedal has a longer travel range than I’d expect from an urban hatchback. On regular roads, they perform reasonably well. On inclines, however, the Kwid will struggle to climb with a full passenger load, and while the Tiago will do a better job of this, you have to be generous with your throttle inputs here, too. Given that neither of these cars are capable of blazing the roads, they’ve been calibrated to offer good ride comfort. The Duster’s excellent bad road ability gave Renault’s engineers something good to work off and given the fact that the Kwid has been designed for markets like India, its ride quality is commendable. While it is planted at city speeds, it does get a little unsure once you hit triple digits and crosswinds can easily catch it off guard. The Tiago gobbles up potholes effortlessly as well, and while its 170mm ground clearance makes you a little more conscious of big speed breakers than you will be in the Kwid (180mm ground clearance), it’s more than enough. Neither one of these cars can be labelled good highway cruisers, but the Tiago is more planted at higher speeds. Both cars have light steerings that make ambling about in the city a breeze. While the Kwid’s is noticeably lighter, it’s devoid of feedback or weight and that doesn’t change even when you hit high speeds and this makes you reluctant to cross double digits on the digital speedo. The Tiago’s steering doesn’t offer much feedback either, but it weighs up well as you pick up pace and you can be more confident while driving it at around 80-100kmph. The Tata also has the better set of brakes and the car feels composed under hard braking as well. A little more bite would be appreciated, but the brakes are tangibly better than the Kwid’s stoppers. The Kwid’s brakes will do a good job at city speeds, but there’s no confidence inspired on the highway. Panic braking will result in the slim tyres locking up and like we mentioned before, you don’t get the safeguard of anti-lock brakes either. Variant-to-variant the Tata Tiago is more expensive than the Kwid by Rs 60,000 to just over Rs 1 lakh (around Rs 3,000 more on an EMI basis). The Renault Kwid is still a well-packaged, wallet-easy proposition with a good amount of cabin space, surprisingly good ride quality and an efficient urban engine. However, the Tiago offers fantastico value for the additional money you pay. You get a better engine, more comfortable, spacious and premium interiors, better build quality and let’s not forget, more safety tech as well. It’s a genuine effort by Tata and after winning us over with its quality, its pricing just puts the cherry on top. Also, consider this. Renault will be launching the Kwid 1.0-litre soon and that will be more expensive than the model you can buy right now, reinforcing the Tiago’s case. In this price bracket, chances are you’re a first-time new car buyer who will be moving up the motor chain in three to five years. So why lose value on your first car and then upgrade when you can sign that cheque for the better car for not much more money in the first place?